We cannot ship any order under $35 total order value. International orders $150.00 minimum. We will allow freight on all orders of $475 or more. Continental US only. The order must be paid within 30 days from the date of the invoice. A copy of the freight bill showing the amount deducted must accompany your remittance. All truck orders sent freight collect. Continental U.S.A. only. Air shipments not included. F.O.B. Bristol, PA. Shade orders allowed 10% of invoice value or the total freight charges, whichever is less. Iron Loaders, no freight allowance. Liability with truck shipments cease when signed for by the pick-up driver. On receipt of shipment have delivery driver sign freight bill noting damage to protect your claim. Please notify carrier at once. Drop shipment service is not available on C.O.D. orders. Should damage occur, accept shipments and advise us at once. We will issue credit or, if you wish, re-ship. Do not refuse carton(s). Must be made in writing within 10 days of receipt of shipment. We will not accept any returned merchandise without our written permission. A check that has been returned will have a $25 service charge. Under present conditions, prices are subject to change without notice. We welcome our customers to visit, and pick up their order. To obtain an open account you must submit three trade references. Or, you may use Visa, MasterCard or Discover. A coordinated effort will be made, however we cannot be held responsible for cancellations. We will endeavor to comply. However, if not possible within the scope of our operation the addition will be treated as a separate order subject to the terms and conditions. The products in this catalog are shown for identification purposes only and do not necessarily represent the product of any specific supplier or company. If your invoice/packing list shows an item back-ordered ($10.00 minimum), we will ship it within a short period of time. Please specify if you do not want back orders. When in the area we would be happy to have you visit our office, showroom and our plant. Our personnel will be pleased to make your acquaintance. 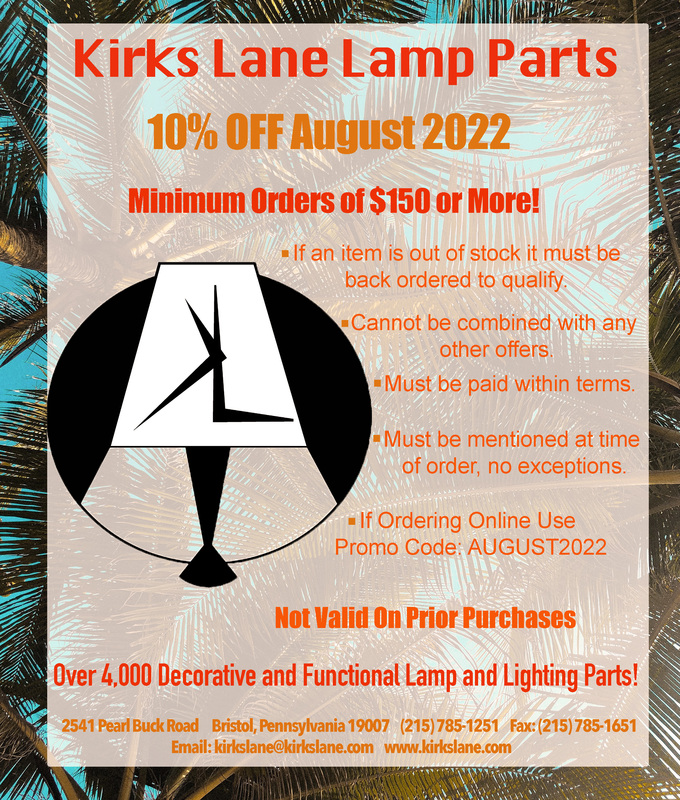 Kirks Lane Lamp Parts Co., Inc.